A.C. is a 1988 graduate of Battery Creek High School and served in the United States Navy. He is a veteran of the 1991 Operation Desert Shield/Storm in the Persian Gulf. After being discharged from the Navy in 1992, Arthur resided in Jacksonville, FL. While living in Jacksonville, FL., A.C., unfortunately, began to make really bad decisions. In the year 1993, he turned to a life of hanging out, partying and drinking, and doing/selling drugs. Within a year's time A.C. went from respectable war hero, to street thug/drug dealer, to a convict that landed in the Duval County Jail on several occasions. This lifestyle, coupled with A.C. trying to hide it from his father, Pastor Cummings, began to wear him down mentally and spiritually. So much so that at one point he even considered suicide. Then Jesus stepped in! In 1994, upon realizing that it was a time for a change, A.C. received the Lord Jesus as his personal saviour! 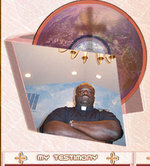 He became a member of Bethel Word & Worship Deliverance Temple and in 1996 was ordained a Deacon. It was during this time in his life that the “call to preach” came alive in his spirit. A.C. received his ordination as a Minister in August of 2003. Currently, at Bethel he is the Youth Pastor, a member of the Adult, Male, and Youth Choir, the Men’s Auxiliary, and the Pastor’s Aide. In March of 2004, A.C. founded the organization called the United Brotherhood Of Christ, LLC. U.B.C. consists of men from various churches within the community who share a common conviction and purpose, which is to step out of the place we traditionally know as “church” and take this glorious Gospel of Jesus Christ to the streets! U.B.C. has established and/or is affiliated with five ministries: the “Young Lions Of Judah” Mentorship Program, the “Taking The Gospel To The Streets!” Street Service Ministry, The “Spanning The Globe” Christian Radio Broadcast, Project “W.A.R.F.A.R.E.” (We Are Ready For A Real Experience), and the “United Brotherhood of Christ," LLC Productions Music Ministry. A.C. always had two deep passions: Poetry and Hip Hop. Since he was a child, he always enjoyed both. So being the Youth Pastor at Bethel, and working with youth frequently with the brothers of UBC, he decided to tap into a talent that he hadn’t used for quite some time…put poetry to music, other wise known as Rapping. This time, however, the music would not be your typical hip hop music, but instead Christian Rap music that would be totally based on scripture and created to minister to our Youth. Since then, his solo CD Project, MY TESTIMONY, has been a huge success with the youth (and elderly alike! ), locally and has potential to make an impact on a much larger scale. A.C. “da Preacha” believes that God has called him to preach the Gospel of Jesus Christ to all, but his ministry is geared primarily to the Youth. It is his conviction that God is desperately trying to reconnect with the younger generation and convince them that Jesus Christ loves them all.